Empowering women in technology fields. We are honored to host some of the most interesting and innovative tech women in the Bay Area! With Google, Jawbone, Airbnb, Blurb and others, the event presents a stellar cast of panelists! Sarah is an award-winning digital media innovator and author of The Digital Mystique: How the Culture of Connectivity Can Empower Your Life — Online and Off. She began coding at age nine, launched her first online endeavor at age 14, and went on to work in IT security, Internet product management, and tech policy, and digital media, founding three companies along the way. Over the past decade, Sarah has advised technology companies, nonprofits, and government on digital media, with a special emphasis on projects empowering women and girls. Her articles have been published in Harvard Business Review, Forbes, Boing Boing, The Huffington Post, and The San Francisco Chronicle at SFGate.com. In 2012, she was named one of the Silicon Valley Business Journal“40 Under 40” rising stars. Rachael is a sales executive at Google San Francisco for the DoubleClick Ad Exchange. Rachael considers herself an "Intrapreneur" where she volunteers 20% time for Google's internal mindfulness program, TalksAtGoogle, and training her colleagues on emotional intelligence and how to be more aware to enhance performance in all areas of life. Her forthcoming book, Pause (Spring 2017) weaves in psychology, existentialism, and neuroscience-based research as she explains how pausing can boost your emotional intelligence and ability to act, feel, and communicate authentically and responsibly through her and others’ stories of pausing. She writes regularly for sites including the Huffington Post, and leads workshops and speaks on the practice of pausing. She is certified in Transformational Coaching from the Wright Graduate University for the Realization of Human Potential (ICF certified), and has an MBA from Fordham University. Judith (pronounced you-did) is the Director of Program Management at Blurb. A native of the Black Forest region of Germany, this year marks her 20th anniversary as a San Franciscan. Her career path in tech began in 2000 when Macromedia—the inventor of Flash—was seeking a European to manage their foreign language online stores. Following that she was at Adobe as eCommerce Manager for 5 years. Judith has since held other positions in Program Management, Product Management and eCommerce Operations. Judith is an Agile advocate and coach. Her passion lies in custom process development, Growth Hacking and scaling teams. Judith resides in Hayes Valley with her partner Brett and toddler Niels. 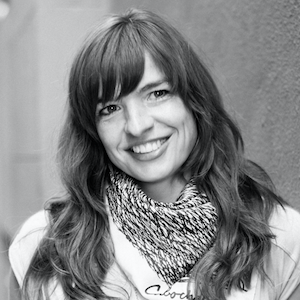 Marine is an entrepreneur, innovator, and passionate evangelist of user experience principles. She heads user experience design at Thomson Reuters, focusing on mobile and emerging technologies. She runs workshops on Design Thinking and Lean UX, and advocates for open innovation. She started the iOS Network Lounge Meetup which now holds 850+ members in the Bay Area. Marine founded Bamboudesign, a web production company in Paris in 2004, turned into a mobile app development business in San Francisco in 2009. Prior experiences include international e-commerce management at Macromedia (pre-Adobe acquisition). Marine is a French native and lives in San Francisco with her husband. Donna is Airbnb’s first Director of Product dedicated to hosts where she drives innovation for hosts. She is a self-confessed product geek obsessed with building smart technology that enables new ways of creating and consuming content. Donna started out at the Harvard Business School where she researched the global economic impact of technology innovations. Since then she has focused on how to empower creative people to bring beauty and outstanding user experience into the digital world, working with companies like Starbucks and New York Times to create new digital content experiences. Before Airbnb, Donna was Chief Product Officer at Blurb, helping design-minded customers optimize their storytelling for tablets and smartphones. As V.P. of Product at Callaway Digital Arts, she worked with publishers to produce award-winning illustrated books for the iPad. Follow Donna at @donnaboyer on Twitter. Nono is a Senior Software Engineer at Jawbone where she works in the Platform team. She works closely with web and mobile client developers and other engineers to build applications services and API that are fast and reliable. She enjoys the mission of making people healthier. Nono is passionate by the "moms/moms to be" industry. 4 years ago she created a website for Francophone moms, Les Ptits Mwana, with the mission of helping moms and moms-to-be find specific resources. She endorsed the hat of Product Manager and Community Manager. She enjoyed working on other sides of a Product to get a different perspective in her daily job of Software Engineer. Nono is a mother of 3 small children, she and her husband moved from France 10 years ago to live the adventure in San Francisco. She is a Zumba instructor, a fitness addict and will soon complete a Spartan Race Trifecta. Aroo! Kelly Currier manages the Agile Program for Salesforce's Technology & Products organization, an enterprise with over 400 agile teams. Salesforce has one of the most notable big-bang agile roll-outs, that is still thriving 10 years in and counting. Kelly manages a team of enterprise agile coaches that enable Salesforce's technology teams to deliver products and services like clockwork 3 times a year to customers. Kelly's previous experience includes being a release manager, technical program manager, ScrumMaster, Product Owner and an agile coach. One of the first User Experience Design & Research professionals, Nancy began her career at Apple Computer in 1988. She went on to manage, lead, and build award-winning, customer-centric, product design teams at ABCNews, HarperCollins, Scient, and eBay. Nancy founded Dickenson, LLC in 2010. Over the past 5 years, she has created a series of workshops designed to empower UX Professionals in achieving a next level of impact, innovation, and influence within their organizations. Recent clients include: Intuit, eBay, PayPal, Wells Fargo, Walmart, MasterCard, Intel, Mindbody, Financial Engines, and Google. Nancy is Professor and Executive In Residence for Bentley University’s User Experience Design & Research Graduate Program. She also teaches seminars worldwide on UX Leadership and Strategy for The Nielsen Norman Group.